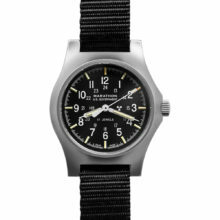 Authentic military issue: The Holton Professional watch with NATO strap is the first watch from a British company, Elliot Brown, in over 10 years to be approved by NATO. 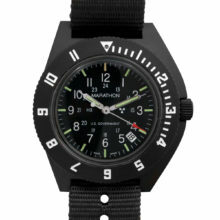 With special design features incorporated with input from military users, rated for 20om water resistance and ISO1413 shock resistance, the Holton professional watch features a bead blasted PVD coated case, triple seal screw down crown, SuperLuminova Dial/flooded bezel, a uni-directional bezel that can be turned barehanded or with wet glove from top, proprietary secure strap mounting system and more. 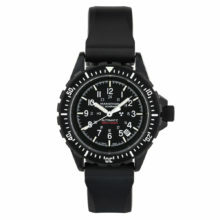 This model features Elliot Brown’s proprietary rubber dive strap. 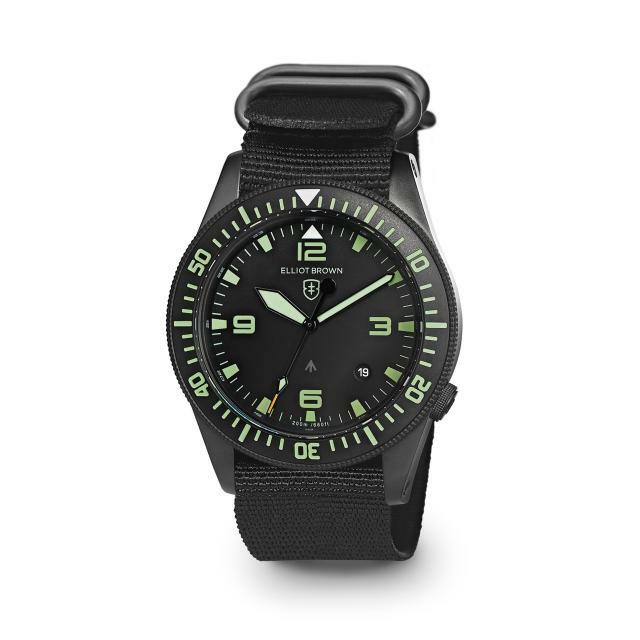 The Holton Professional watch is a new watch that was developed in collaboration with and for a special forces branch of the British military. The Holton Professional watch series is the first military issue watch to be created by a British watch company in more than ten years. 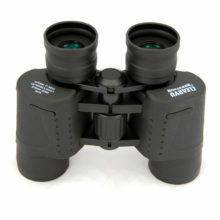 It is fit for purpose and designed for use every day no matter how harsh the conditions. 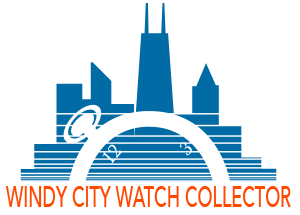 Read on about the special features incorporated into the design of this watch…. 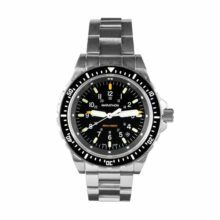 Having purchased Elliot Brown watches privately it became clear that British military personnel preferred them to the watches they had previously been issued and approached Elliot Brown to develop a new model specifically for military issue. 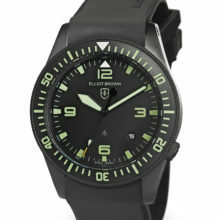 To develop a new watch from the ground up, Elliot Brown asked military personnel to bring their current resistance and discuss what worked and what didn’t, only then were they able to fully understand the requirement and create the internal brief that made sure the new Holton Professional watch would perform faultlessly. The result is the Holton Professional watch with a bead blasted .8 micron PVD coated stainless steel case, patented shock protection system, spring bars that will not break easily, a bezel that can be operated easily even wearing gloves. 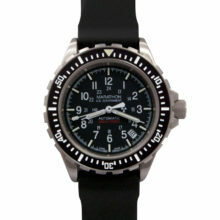 Its water and dust resistance is up to harsh conditions and it has fit for purpose straps that are easy to change. Finally, it is a watch that is instantly readable day or night thanks to a well-designed dial and bezel utilizing vivid numerals, markers, contrasting markers/handsets and the use of C3 SuperLuminova. 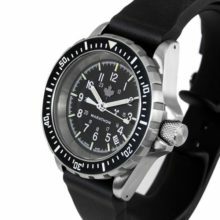 The Holton Professional watch is a terrific field and diving watch whose design language echoes that of vintage British military watches yet with all the trademark Elliot Brown house design cues, creating a sense of continuity and familiarity. 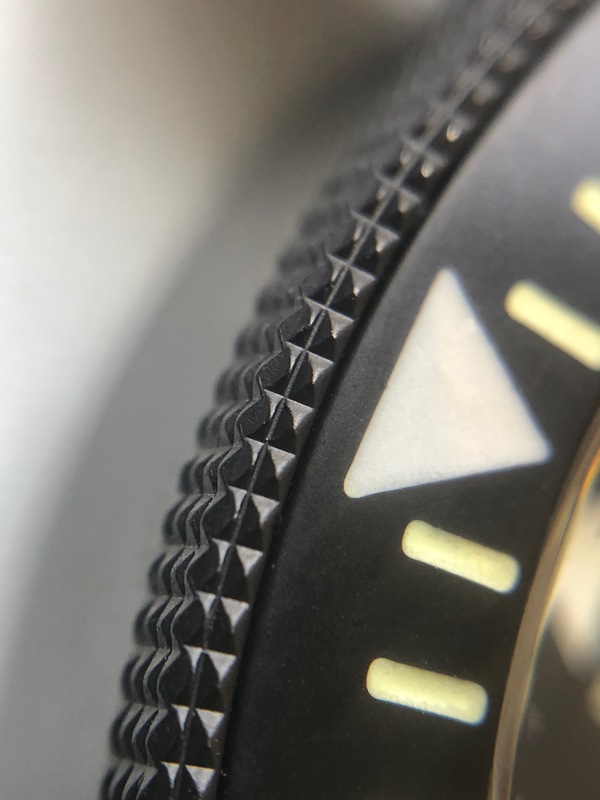 The specification of the bezel gives perfect insight into the level of detail required for the Holton Professional Watch project to be successful. 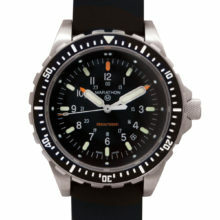 A precise 120 click high grip bezel houses a stainless steel insert precisely embossed with hours and minutes indentations then flooded with high-grade C3 SuperLuminova. The hobnail outer knurling is slightly higher than the insert to form a high grip surface for trustworthy operation even when using the palm of a wet gloved hand. Both components are matt bead blasted, hardened to 1200HV (Vickers hardness scale) then a 0.8 micron PVD coating is applied whose hardness matches that of the stainless steel components. 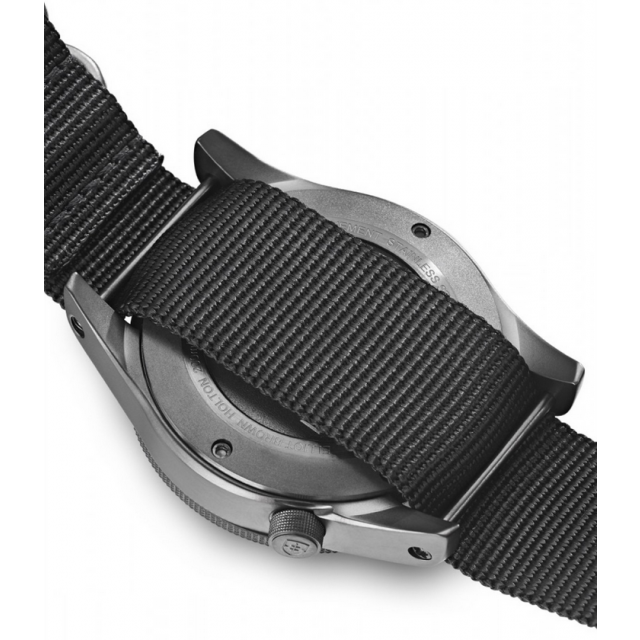 Straps are easily changed and secured via solid steel screw in bars operated with an included five lobe tool and matching socket in the strap bar ends. 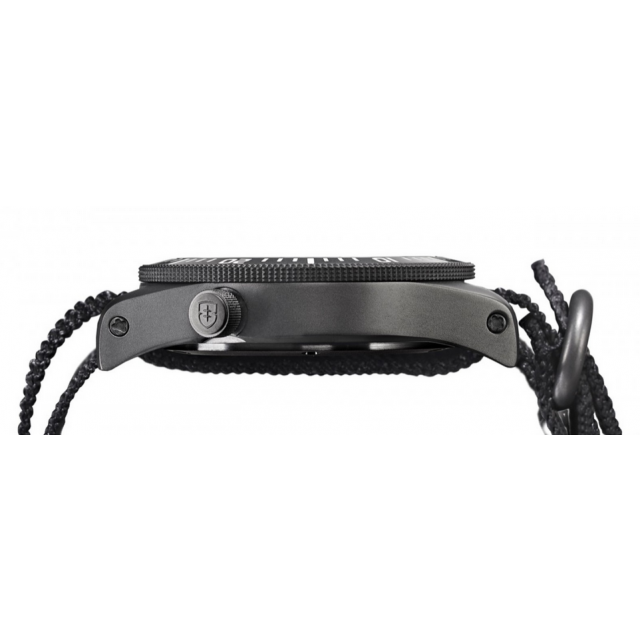 The recessed crown sits neatly out of harm’s way at 4 hour position while retaining the immense water protection afforded by Elliot Brown’s proprietary triple seals. An additional screw down mechanism locks the crown into the case. 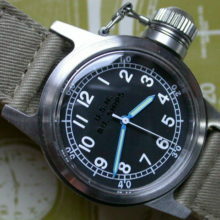 The Holton Professional Watch has been assigned the NATO stock number 6645-99-303-0677: Time-measuring instruments; United Kingdom, and features the ‘Crow’s foot/Pusser’s Arrow/Broad Arrow’ on the dial in subdued grey. 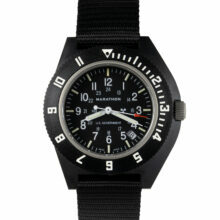 The Broad Arrow has historically been applied to UK issued military equipment including British Military watches. The Holton Professional Watch takes its name from Holton Heath in Dorset, the location of a wartime cordite factory from World War I and World War II. 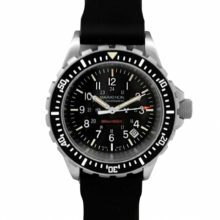 Water Resistance: 200 meters, manufactured to ISO 2281 standard, each watch is pressure air tested twice to 150m/15ATM and then 200m pressure test in water to 200m. 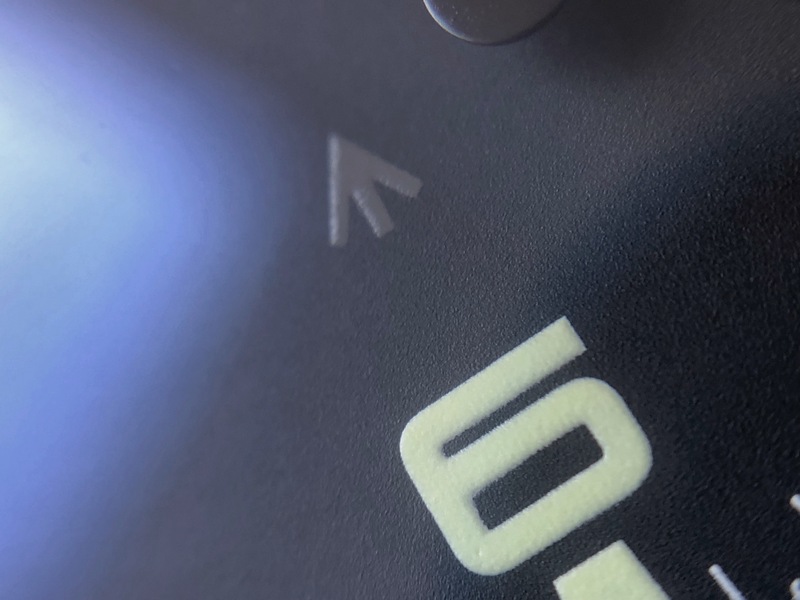 Case back: The solid and beautifully detailed case back is bolted down for a perfect seal with multiple surfaces to minimize the contact patch with the wrist in warmer conditions. Shock protection: Patented system — Swiss movement is housed inside a unique steel housing, suspended on a series of elastomer dampers to give a high level of shock protection. All watches exceed ISO1413 standard for shock resistance and this is proven by subjecting a few watches in each production run to striking from a 3kg pendulum mallet that applies a force of 5000G at the point of impact!